Staples announces a new collaboration with Workbar to offer coworking within 3 Staples retail locations. 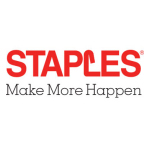 FRAMINGHAM, Mass.--(BUSINESS WIRE)--Staples, Inc. (NASDAQ: SPLS) and Workbar today announced a new collaboration to offer coworking facilities within select Staples retail locations. Staples and Workbar will make more productive workplaces happen for small business customers, independent professionals, startups and the growing mobile workforce in three Massachusetts locations starting in late spring. The first three Workbar spaces at Staples will be opening in Danvers, Norwood, and Brighton— located north, south, and west of Boston. 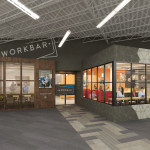 Each of the 2,500 - 3,500 square-foot custom-designed facilities will offer a mix of high-end workspaces, conference rooms, private phone rooms, fast and secure Wi-Fi, printers, and bottomless coffee and tea to keep the connectivity and productivity flowing for business customers. The Workbar locations within Staples will be operated by Workbar and will offer coworking memberships, pre-scheduled meeting space, use of Workbar’s downtown locations, and access to its in-person and online community – a network that offers tips and advice, has connected investors and great ideas, and regularly yields partnerships or job offers. An added benefit and thanks to this collaboration, Workbar members will automatically be enrolled in the Premier Level of Staples Rewards. 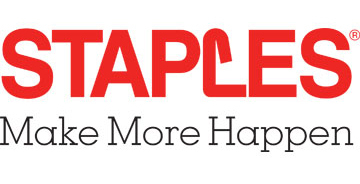 “At Staples, the Workbar space will be a great complement to our existing suite of business relevant products and services -- Print and Marketing Services, Business Services including shipping, Tech Services and office supplies. This provides our customers with the unique opportunity to obtain virtually everything they need to stay up and running and to make their businesses succeed right from our stores,” said Scala. To learn more about Workbar’s coworking network, please visit: workbar.com. Workbar’s focus is creating great places to work that bring the ideal office to you – convenient, affordable, and populated by a friendly mix of motivated professionals. Our growing network of high quality coworking office spaces offers independent professionals, small businesses, startups, remote teams, and other mobile professionals a mix of comfortable work and meeting spaces and amenities so you can make the most of your work day. Workbar’s hub-and-spoke network is connecting urban centers to well-placed suburban locations, making coworking more connected, convenient, and local. Our robust digital presence and active events calendar supports interaction and community both online and in person; members share tips, ideas, and recommendations, identify the right tools and talent, and are inspired to do great work. Find out more at www.workbar.com.